An entertaining & educational demonstration of dog training methods, gundog skills and a wonderful array of tricks – a real crowd pleaser at any event! Stephen & his team have appeared all over the country from Cornwall to Yorkshire including at the New Forest Show, Buckham Fair, Frome Show, Salisbury Jubilee, Wessex Country Fair, Ellingham Show and many village & local events. Over the years we have seen many dog training demonstrations but this was one of the best. Stephen’s style was so engaging and even though we are unlikely to ever go shooting we were inspired to get the clicker back out! It was fun as well as instructive, if only we had a fraction of his skill, how happy would our cockapoo be! Look forward to seeing him and his dogs again. Thank you Sally for your kind words. I’m really pleased you enjoyed the show. Please give me a call if you need any help with your Cockapoo! I hope we meet again at some future show. The best gundog demonstration I have ever seen! The Wessex Country Fair was thrilled to welcome you and your dogs back for a second year by popular request. Both you and the dogs were a huge hit again: the audience was once again thrilled by the level of obedience and skill shown, and thanks to your unique approach of breaking down the training to show how the dogs are taught, everyone was held spell bound for the whole display. I'm sure some went home inspired to improve the obedience of their own dogs! It was lovely to see you and your team again, and please pass on my thanks to them for giving up their day to support the hospice. Thank you so much for all of your support, and for adding so much to the show. "After watching your gundog training display at the Wessex Country Fair on 16th August, I feel I must offer my congratulations. Your wonderfully sympathetic and compassionate approach to the training of both Daisy and Poppy with remarkable results, has my total admiration. It was wonderful to watch, you had us spellbound. Your 'unconventional' method just seems so natural and I can only hope that future dog owners take note and follow your teaching, I most certainly will. Thank you." A great demonstration at the Wessex Country Fair on 16 August. Wonderful to see Stephen, Daisy and Poppy in action, certainly the highlight of the day combining information, skill and great humour. My partner, Jenny, has fallen in love with Poppy. 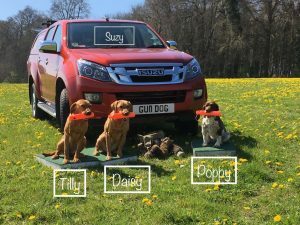 This is the second time Salisbury City Council have used Stephen and the Gundog display at one of our family events and we are always delighted with the show which is educational, informative and fun for our audience. We would not hesitate to use the show as part of a future event. “Stephen provides such an enthralling and thoroughly engaging display of dog/owner training that we’d have Stephen back at any future event – no question! No matter how many times I’ve seen Stephen and his wonderful dogs in the ring, I’d watch him over and over as there’s always something to learn - or remind yourself again that you’re not doing!